We’d love your help. 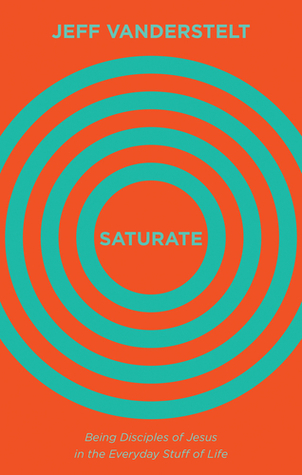 Let us know what’s wrong with this preview of Saturate by Jeff Vanderstelt. To ask other readers questions about Saturate, please sign up. I wanted to give this 3.5 stars but rounded down instead of up. I need to separate my thoughts about the book itself and my thoughts about his ideas. The reason I rated this 3/5 stars is because of the book itself. Most of the information in this book is simply repeated. This could've been 3 (although longer) blog posts. It did not require a whole book, or one of this size, to tell. I also felt he highly disliked the word "church". I only remember hearing it once in the whole book. Usuall I wanted to give this 3.5 stars but rounded down instead of up. I need to separate my thoughts about the book itself and my thoughts about his ideas. The final big thing I didn't like this book was the lack of scripture. The book is 35% story and maybe 1% scripture, if that. I'm not saying what he wrote was unbiblical. He just didn't root it in the Scripture like I would expect from a Reformed (and from Crossway) title. As for what he said, most of it was really good. The parts on compassion and city outreach were golden, though my favorite sections were the ending chapters on how to practically start the kind of "gatherings" they talk about in the book. I LOVE the idea of having the church meet for dinner regularly in people's homes. How our churches would change if we did this every 2 weeks! Also, although this book is missing a lot of Bible verses, it is FULL of the gospel. From the reason we meet, to the doctrine of vocation and Coram Deo, to reaching out to the lost, to giving one's finances to church families who are in need are all deeply rooted in gospel thought. It was edifying and encouraging to be reminded of these things. This book is essentially everything Jeff has ever said condensed in a way that almost everyone can understand. If you are a fan of SOMA, been to a training, this book will feel very elementary in that you have heard it all before, but if you are new to the idea of missional communities I couldn't recommend this book any higher! The purpose of the book is to see the whole world saturated with the message of Jesus by word and action through ordinary people. It paints a great picture of everyone sharing in the work of the gospel and being deep in each other's lives, rather than merely attending event-based church on Sunday where a few participate and the rest just watch. I agreed with most of the content and will definitely apply much of it in our small group. However, there are numerous troubling aspects of this book as w The purpose of the book is to see the whole world saturated with the message of Jesus by word and action through ordinary people. It paints a great picture of everyone sharing in the work of the gospel and being deep in each other's lives, rather than merely attending event-based church on Sunday where a few participate and the rest just watch. I agreed with most of the content and will definitely apply much of it in our small group. However, there are numerous troubling aspects of this book as well. I think they are all tied to the fact that Jeff lacks the "prophet" role in ministry. He advocated for non-confrontation of a doobie smoking/drunk new disciple of Jesus. Jeff just follows this new Christian around a concert while he gets high and drunk, keeping him out of trouble. Though people suggested he be confronted, Jeff wanted to pray for him to be convicted instead. The fact that this happened was evidence for him that it was a good idea. Very pragmatic. Another instance was a person stopped attending church almost entirely. His solution was to start praying for him again. This is an example of a deeper problem where he often presents being "spirit led" in these types of situations to justify non-confrontation. Then there was him lifting up examples of his group serving as designated drivers for pub crawlers and a pastor serving as a bounce-house operator for an LGTB community party. A pastor serving at an LGTB event communicates approval to those who onlook (1 Thess 5:22). Though these are done with good intentions, they are not helpful. In Jeff Vanderstelt's book, Saturate: Being Disciples of Jesus in the Everyday Stuff of Life, he is talking about something more spiritual than kids who sp My three year old spills things. My almost one year old spills things too. Because of this I have a good idea of what the word saturate means. 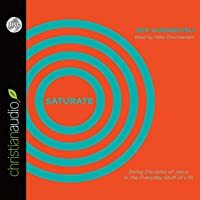 In Jeff Vanderstelt's book, Saturate: Being Disciples of Jesus in the Everyday Stuff of Life, he is talking about something more spiritual than kids who spill things. He is referring to our life with Christ spilling over into our everyday mundane lives. "It has always been God's intention to choose normal, everyday people, and to show his amazing power and glory through them." "Church is the people of God doing the work of God in everyday life." "Jesus lived a normal, quiet life for thirty years in an unknown town....The difference is that Jesus did everything for his heavenly Father's glory. He lived all of his life as an expression of his love for God the Father...He set apart every aspect of life as holy unto the Lord." This aspect of the book encouraged and challenged me. Being a stay at home mom is as normal and real as it gets. My days are consumed with taking care of little ones, and I'm learning that this work is holy unto the Lord; it is my primary ministry and mission in life right now. This was the encouraging part, and yet the challenging part is the area I am weak in right now, which is extending this mission and ministry beyond my family. Because of this book I'm now intentionally thinking through ways I can (with my family) reach out more to fellow Christians and non-christians in my home. "Life on life, where our lives are visible and accessible to one another; life in community, where more than one person is developing another; and life on mission, where we experience making disciples and, while doing so, come to realize how much we need God's power." "Who is God? He is our King (the Son). What has he done? He came not to be served, but to serve, and to give his life as a ransom for many. Who are we? We are servants of the King of kings. If we believe this, what do we do? We serve the least of the people of the world as an act of worship of our King. " You don't have to be a pastor or missionary to engage in the mission and ministry work of Christ; you just have to believe, by faith, in the saving work of Jesus Christ. We are sent by God into the world through our normal lives: our day jobs, school, community work, the grocery store, the local library, and our homes. This is true Gospel saturation. This is how God chooses to fulfill his work, plan, and purpose on the earth until he returns. We get to be apart of this in the everyday stuff of life; let's saturate where we are right now. "Who is God? He is Spirit. What has he done? He sent and empowered Jesus the Son to take on flesh and to seek and save what was lost. Who are we? We are missionaries, sent and empowered by the same Spirit. If we believe this, what do we do? We make disciples of Jesus through proclaiming the gospel in the power of the Spirit." I will have to admit when I got into Jeff's journey of missions, I thought here we go again. Another book about missions that is pragmatic and has no life. The deeper I got into the journey, the more it spoke life into me and that is what the gospel does. Jeff's background began in the Mega of Mega churches...Willow Creek and it was leaving the mega that opened his heart to what the gospel is really about, living in community. To be honest, as a Christian, I have not experienced living in commun I will have to admit when I got into Jeff's journey of missions, I thought here we go again. Another book about missions that is pragmatic and has no life. The deeper I got into the journey, the more it spoke life into me and that is what the gospel does. Jeff's background began in the Mega of Mega churches...Willow Creek and it was leaving the mega that opened his heart to what the gospel is really about, living in community. To be honest, as a Christian, I have not experienced living in community like Jeff has experienced and I think most Christians would be hard pressed to have experienced that as well. Jeff starts with the basic foundation-the Gospel and the Gospel revealed by the Holy Spirit leading. I loved the emphasis of the Holy Spirit. The clarity of the work of the Holy Spirit and how we can get in the way of that work. Many times Church becomes an event, another program, another thing to do once or twice week. We cannot have community that way. Speaking from experience, working at my church several years ago for 10 years, I did feel and experienced community, but when I was let go, my community was as well. To be honest, I have not recovered from that and reading Saturate made me realize how I am grieving for community. So if you are in church leadership, it is a easy thing. However, when you have a job, a family, and 20,000 million directions pulling you away from community, it can be difficult to be in community. Don't misunderstand me, we still need to strive for community for the health of the church, our maturity, and our relationship with the Lord and others. Jeff's community got that, applied that and lived it. It strived not to leave others behind and to pursue and not give up on people. If there is one in the party that is not willing to give up, someone has a chance, but when all parties give up on a lost sheep, that sheep may be lost forever. Love your sheep! Many things keep you from community. Is it doubt? Is it fear? Lack of confidence? All things belong to Christ-your doubt, your fear and your confidence. This is a process, this takes the holy Spirit. Reflect on this. Pray on this. Find examples in others, to be transparent with. Reveal your brokenness-don't ignore it. Another personal reflection for me is are we living in community within our own families. If not, it would be a good start and if that is not possible, pray for a family that live in community with you. Jeff's experience in being disciples of Jesus in everyday stuff is encouraging. He does not portray it as easy, but so worth it. It is the everyday stuff like eating, how meals can have eternal significance. Learning the art of listening because it is in the listening we can be applicable to the needs of those in our community. Celebrating life with each other like birthday, anniversaries. Where there is celebration, there is joy. Learning to play and laugh with each other as well. This is where bonding takes place. Many great ways where community can do every day life together and be a family to each other. Conflicts will happen but it is in the conflicts where real discipleship takes place. Regardless of how you apply discipleship and community, it is Jesus work in you that will He will see to the end. Don't put your hope in your faithfulness but in His work in you. A Huge thank you to Crossway Books and Netgalley for an ARC copy and the opportunity to review. "Wordy" is a strange adjective for a book, don't you think? And yet that was my feeling throughout this book. No, the prose isn't flowery or poorly constructed. It's just that this book uses so much boilerplate it's difficult to strain out its unique contribution. There must be a way for the Gospel-centered, missional camp to say what we need to say without saying the same things every single time. Like maybe referring to a confessional document of some kind. I don't know what the solution is - "Wordy" is a strange adjective for a book, don't you think? And yet that was my feeling throughout this book. No, the prose isn't flowery or poorly constructed. It's just that this book uses so much boilerplate it's difficult to strain out its unique contribution. There must be a way for the Gospel-centered, missional camp to say what we need to say without saying the same things every single time. Like maybe referring to a confessional document of some kind. I don't know what the solution is - we need to hear the Gospel repeated, but a hundred other authors have already said a lot of what's in here. I get it, though. This is Jeff Vanderstelt's turn in the conversation, and he needs to show his Gospel credentials, as well as state clearly these eternal truths for those readers who will hear him first. Which is a bit of a shame for the rest of us because he is truly a revolutionary leader with some unique ideas! Unique, not in the sense that these ideas can't be found in Scripture, but in the sense that the church has largely abandoned them. This is heart of what it means to BE the church. Other authors have embraced the idea of "everyday church" as the posture of the institution, but Vanderstelt may be one of the first in recent times to treat everyday discipleship as the essence of the church. The reader will not find any mention of worship services or church org charts but plenty of descriptions of "family" and "gathering," even "teaching." If there were such a thing as an "organic" church, this is it. Theologically rich, helpfully practical. Full of encouraging real-life examples of what it can look like to be disciples making disciples - not just through church programs and Sunday mornings, but through the church community living and doing everyday life together. This is a book about God doing big things through normal people, by the power of His Spirit. For me personally, this book engaged with a lot of my fears of getting close to people in community - both with the church and unbelievers a Theologically rich, helpfully practical. Full of encouraging real-life examples of what it can look like to be disciples making disciples - not just through church programs and Sunday mornings, but through the church community living and doing everyday life together. This is a book about God doing big things through normal people, by the power of His Spirit. For me personally, this book engaged with a lot of my fears of getting close to people in community - both with the church and unbelievers alike. The fear is that things will get messy; sin will be exposed - and what then? Then - the GOOD NEWS meets us. The truth of the Gospel can be spoken to each other, repentance can happen, and Jesus is shown every time to be the true Savior in our stories. We can be humbled as we see restoration happen in each other's lives. "[God's] means of restoration is others in your life who are committed to bringing your brokenness out into the open and bringing the gospel of Jesus to bear on it. The layers with which we've covered ourselves have to be pulled back, and we can't do that kind of work alone. We have to get close. We have to be seen and known. "This is what we call life-on-life discipleship - life that is lived up close so that we are visible and accessible to one another, so that others can gently peel back the layers and join us in our restoration." I have long known of the passion that Jeff Vanderstelt has for seeing communities of believers spread out across cities, states, nations, and the world to display the beauty, love, and worth of Jesus. "Saturate"is a labor of love from Vanderstelt to the church at large, especially those who have adopted a small group meeting through the week model of church, although this would be easily applicable to a Sunday School model as well. Jeff walks the reader through the life of his church through the I have long known of the passion that Jeff Vanderstelt has for seeing communities of believers spread out across cities, states, nations, and the world to display the beauty, love, and worth of Jesus. "Saturate"is a labor of love from Vanderstelt to the church at large, especially those who have adopted a small group meeting through the week model of church, although this would be easily applicable to a Sunday School model as well. Jeff walks the reader through the life of his church through the eyes of their missional communities and all the myriad ways opportunities are present to be the Church to our neighborhoods and cities. I was grateful for the second part of the book, "Jesus", where Jeff walks through the supremacy of Jesus and how he has saved, is saving, and will save us and this reality serves as the foundation for healthy biblical communities that are focused on gospel proclamation, gospel service, and gospel maturity. If we leave out any of the three ways Jesus is saving us we will miss out on holistic ministry that verbalizes the gospel, serves through the gospel, and matures believers in the gospel. From here Jeff builds on the foundation in part 3 about "Discipleship" and part 4 about our "New Identity." It is hard to overestimate how important these three sections are to establishing a firm foundation for any iteration of small group, life group, missional community health and longevity. The most convicting and helpful portion of the book for me was the final section on "The Everyday Stuff." Here is where my mind begin to spin with all of the possibilities that lay before us as a new church just getting started in our city. The conviction settled in as I began to realize just how much of my personal calendar is set with a priority on my family and not on my family being on mission because we belong to the family of God. So often disciple making doesn't happen because our schedules don't show discipleship as a priority. The helpful part in particular came from beginning to think through the rhythms that Vanderstelt and his church identified: Eat, Listen, Story, Bless, Celebrate, and ReCreate. Regardless of where you live these are the things everyone, regardless of beliefs, does every day it is just a matter of the Church thinking creatively and intentionally of how to be involved with other disciples and to borrow Vanderstelt's phrase "those who are not yet disciples." The idea that we are always discipling and being discipled is a key theme in this book. Yes and Amen! It’s not a separate activity it’s life on life. Finished the book feeling encouraged and motivated to continue and grow in living in a way that honors God. Reaching out and pressing in to the lives of others. I gave it a four because I wasn’t naturally engaged to keep reading. Maybe it was the way it flowed and my own attention span. That said I kept reading and I’m glad I did. I learned helpful The idea that we are always discipling and being discipled is a key theme in this book. Yes and Amen! It’s not a separate activity it’s life on life. I appreciate all of Vanderstelt's stories of real-life examples of how we can be Jesus' hands and feet to the world. I am inspired to a) pray that the Holy Spirit will convict others before I confront them myself, b) pray every day that the Father will give me an opportunity to share the gospel that day, and c) study and work for the glory of God every day. 1. He writes like he talks. So there are lots of stories, chapters that read like sermons, colloquial speech, a number of one-sentence paragraphs—that sort of thing. This format can make it a bit difficult to piece together what he is really arguing for. It also ends up making things feel repetitive. I am also not a fan of books that dedicate a large amount of space—sometimes spanning multiple chapters—to explaining the gospel before getting to whatever the book is actually about. I'm all for making the gospel explicit, but I think unpacking it in this way is in many cases clunky and unhelpful. When it's presented like this, it can easily come off as bland or prosaic and somewhat disconnected from the rest of the book—like an obligatory "oh, I really should put the gospel somewhere in here." Often these chapters don't really contribute anything substantial to the overall argument. 2. Perhaps the biggest weakness of the book is that he focuses so much on small groups that one begins to wonder where the rest of church life fits in. For instance, where does the whole-church Sunday gathering fit into his paradigm? How important are the Sunday means of grace vis-a-vis the small group means of grace? Without any sort of counterbalancing affirmation and articulation of the importance of whole-church gatherings, I worry that some might walk away from this book thinking that nothing really significant happens on a Sunday morning. To take another example: Do our community group members need to be our best friends—the ones we hang out with most? What about deep, meaningful, mutually-exhortative (in the Heb 3:13 sense) Christian friendships developing more organically throughout the whole church body or even across different churches (e.g., if you know Christians who live near you, work with you, or go to school with you, who attend a different church)? I wonder if Vanderstelt makes small groups bear *too much* weight here. 3. Some of the stories Jeff tells have questionable elements. At one point he counsels a young man who struggles with sexual sin that he should drop down on his knees immediately after masturbating and thank the Lord that he is forgiven for that sin that he just committed. On the other side of things, at some points he describes certain conversations he's had with other people where it seems like he gets a little too intense and brash. I am torn between 3 and 4, as there were many chapters and sections which I really liked, but there were also times that I found it "tough going" as there seemed to be a lot of repetition of ideas. I also agreed with the author most of the time, but sometimes felt that his recommendations on how to interpret the teachings of Jesus for our culture were a bit risky. As an example, I often felt that if young couples were following his recommendations, their children could often be put at risk. I kno I am torn between 3 and 4, as there were many chapters and sections which I really liked, but there were also times that I found it "tough going" as there seemed to be a lot of repetition of ideas. I also agreed with the author most of the time, but sometimes felt that his recommendations on how to interpret the teachings of Jesus for our culture were a bit risky. As an example, I often felt that if young couples were following his recommendations, their children could often be put at risk. I know that Jesus mixed with all peoples, all cultures, all races, all levels of society, but He was and is the Son of God and also travelled with his disciples and followers as he went about. When we freely open up our home to our neighbours (meaning anyone we meet or want to disciple), we are also putting ourselves and our children at risk in the type of society we live in. Christian men are responsible for their families and mothers and fathers need to be there for their children helping with homework, treating them when sick, hugging and cuddling them, and if one or both of them are also working full time, and active in church work or other volunteer work, it leaves little time left to work with sports teams, school communities, etc. Having said that, I agree that we should never retire from "Making Jesus Known" and we need to be doing it on a daily basis from now until we take our last breath. This review has been hidden because it contains spoilers. To view it, click here. This book really challenged my thinking about church. I disagreed with the author on points of theology and points of application but he did make me think which is never a bad thing. (It all fairness maybe some of my disagreement is not so much from the book but from being at a conference where I was a host for his seminars. I heard him speaker for three different sessions and some of that may be bleeding into this short review) He takes Acts chapter 2 and really applies it to life in ways I hav This book really challenged my thinking about church. I disagreed with the author on points of theology and points of application but he did make me think which is never a bad thing. (It all fairness maybe some of my disagreement is not so much from the book but from being at a conference where I was a host for his seminars. I heard him speaker for three different sessions and some of that may be bleeding into this short review) He takes Acts chapter 2 and really applies it to life in ways I have never really seen before. He seems to be making it work. While reading it I look back on my own life and think some of those things are unrealistic... until really think about it. Then I realize that many of the examples I have done myself with my family. The first 1/3 to 1/2 of the book was spot on it was from there I had to stop many times and have a talk with my wife about what I was reading. This is the kind of book I enjoy because it challenges me. Overall I enjoyed it very much and would recommend it with the acknowledgement that I still disagree with much of what the author says but that you can still benefit greatly from reading it prayerfully. "Seeing church mainly as an event creates a significant problem for mission, because most people are very busy. And the more we fill our lives with church events and programs, the more we get pulled out of everyday life with people who don’t yet know Jesus. Besides, we will never be able to live out our identities of family, servants, and missionaries in one or two church events a week. It must involve everyday life. We need to see that life is the program, because people need to see what it means to follow Jesus in the everyday stuff of life" (Jeff Vanderstelt, Saturate: Being Disciples in the Everyday Stuff of Life). Highly recommend to anyone who wants to learn how to live on mission in everyday life. Discipleship is helping people follow Jesus in the everyday stuff of life. Challenges and gives practical advice to church to live out Christian identity as family, servant, and missionary in everyday life and in community. Only concern: seems to over-correct against the Sunday only Christian. Highly recommend to anyone who wants to learn how to live on mission in everyday life. What a practical yet compelling book about living missionally. If more people lived the way Jesus called us to live as servant followers, the neighbors, the world, would see Gods love shining through brightly in the every day places we don’t think of as the mission-field. The Holy Spirit compels us to move and be in the light of the Gospel message. Sacrifice. Real care. Love in a way that is so deep it can only point to Jesus. This is an excellent journey in discipleship, though not the most conventional path. I read this book constantly on the lookout for a departure from sound doctrine, I never found it. If you are interested in making disciples, in living out your faith, then you should make time to read this book. Well written with real life examples. It will encourage you to reconsider your methods. An incredible book on discipleship, both personal and missional. Jeff's personal experiences and stories here give great insight into the practicality of the kind of lifestyle he preaches, Jesus saturation and missional living. Highly relatable and both simple and challenging to respond to. I definitely recommend this book to any believer, but especially to those interested in church planting or reconfiguring the community life structure of their church. While this is a good book by Jeff, it is repackaged material you have heard 500 times over if you have listened to or followed Jeff. He speaks truth and is good at it. This however feels like a money making ploy I would stay away from if you have heard his stuff before. On the flip side, if you are new to Jeff Vanderstelt, I will just say you need to read this book. This is an excellent vision-casting book for missional communities. It offers some simple ways of explaining the Gospel and mission. The stories Jeff shares are very impactful and encouraging and his writing style is clear even for people who are not strong readers (this is a compliment!). I enjoyed Gospel Fluency and this one is a great companion. So radical and challenging and yet is nothing more than the picture of discipleship that Jesus lays out for us in his life and word. Really good to listen to and practical. Convicting, eye opening, and intriguing. It has helped me realize what opportunities are right in front of me. What has God already placed in front of me and where has he already placed me in this moment to live for his glory? Amazing! I definitely want to go back and go over ideas he puts forth with my bible study. Jeff Vanderstelt is the visionary leader of the Soma Family of Churches. He also serves as one of the teachers and elders of Soma Tacoma. He is the author of Saturate: Being Disciples of Jesus in the Everyday Stuff of Life. He lives in Tacoma, Washington with his wife, Jayne, and their three kids.